The Winix 50 Pint Dehumidifier 50BT is an effective portable dehumidifier suitable for areas of up to 800 sq ft. This unit is ideal for use in smaller basements and other rooms within the home including laundry rooms, bedrooms and living areas. This appliance is designed to operate with maximum effectiveness in ambient temperatures of 65°F or above and would not be a good choice for a basement that was significantly cooler than this for significant periods. Unlike its predecessor the 50BT does not have an integral condensate pump so if this is a requirement for you another brand would obviously be a better choice. The 50BT is of a modern, stylish appearance, compact, relatively quiet and easily portable. This Winix 50 pint dehumidifier is Energy Star™ qualified, has simple controls and is easy to use. The 50 BT will extract 50 pints of water from the air in AHAM (Association of Home Appliance Manufacturers) standard test conditions of 80°F and 60%RH. At lower temperatures or in drier air this rate will be far less so please do not worry if your appliance does not extract as much water as the "headline" figure might suggest. The water extracted from the air is collected in a bucket which has to be emptied at least once daily. This may be an inconvenient chore which can be avoided if the continuous drainage option is used. To take advantage of this option a length of plastic hose must be attached to a water outlet in the appliance through which the water can be drained to a suitable disposal point. Annoyingly a hose is not included with the appliance so must be purchased separately. Continuous drainage is by gravity feed so it will only be possible if the hose leads to a drain at floor level. If such a drain is not available the bucket must be emptied manually or a condensate pump used to force the water to a drain outlet at a higher level in the home. Most such pumps can achieve a vertical lift of 12 to 15 feet. If you are intending to use and empty the bucket you can be assured that, if you are unable to do so at any time, the bucket will not overflow as there is an automatic cut-off mechanism which stops the dehumidifier operating once the container is full. The Winix 50 pint dehumidifier 50BT is a relatively compact unit and takes up a minimum of floor space. This is helpful if space is limited but please be aware that adequate clearance must be left for both the air intake and exhaust vents. This is not only important to ensure that the unit can function effectively but also to prevent the appliance over-heating - a potential fire risk. This model is genuinely portable, being mounted on caster wheels and having carry handles to lift and move the unit. At a tad under 40 pounds in weight it is manageable for any medically fit adult or teenager. This model is easy to use with simple electronic controls and a clear digital display. These controls include an adjustable humidistat with which you can select a level of humidity, from 35% to 70%, in increments of 5%. A good starting point for those new to dehumidifiers is 50% which most people find comfortable and is enough to inhibit the growth of mold. A useful on-off timer is included. With this control you can program the unit to run for 3, 6 or 12 hours before turning itself off or to start running up to twelve hours after you instruct it. The Winix 50 pint dehumidifier has three fan speeds; low, high or automatic. It may also be of interest to some of you, who feel strongly about this issue, that the fan only runs while the appliance is dehumidifying, switching off when the target level of humidity has been achieved. 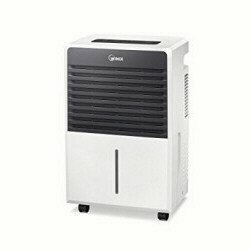 Like most dehumidifiers the 50BT has an auto-defrost feature. So-called "refrigerant dehumidifiers" work by passing ambient air across a metal coil cooled to such a low temperature that moisture in the air condenses onto the cold metal. Ice can form on the coil, even at normal room temperatures, and has to removed as it degrades performance. The appliance stops cooling the coil but the fan continues. The flow of air melts the ice and, when it has gone, the compressor restarts and the unit removes moisture once again. One feature, much appreciated by users, is the Cleancel coated water tank which helps to stop the build-up of mold in the tank. Occasional cleaning of the tank is one of only two maintenance tasks the Winix 50 pint dehumidifier requires; the other is cleaning the air filter. Ambient air passes into the unit continuously while it is working. With the air comes dust and an air filter is installed to reduce the volume of particles entering the appliance. As the dust is trapped in the filter it is essential to clean that filter every week or two. The 50BT has a washable air filter to make that cleaning more effective and complete. Cleaning the filter is essential. A clogged filter not only lowers the performance of your appliance but can also increase the risk that your dehumidifier may catch fire. A significant number of reported dehumidifier fires result from neglect and/or a failure to follow instructions for use included in the user manual. Click on the link to download the Winix 50BT Manual. The Winix 50BT is not as widely known as some of the more familiar US brands and smaller numbers of them are sold to US residents. Unsurprisingly the number of user reviews is also smaller but most of them are from satisfied and happy customers. Of these reviews the most interesting are from individuals who have owned one of the better known brands because they reveal that the Winix performs at least as well as the more popular models. Reviewers remark on the relative quietness of this machine, its build quality and its effectiveness. The most general complaint concerns the failure of the manufacturer to include a length of hose with the appliance to take advantage of the continuous drainage feature. Inevitably there are a few purchasers who have taken delivery of faulty units but, as a proportion of users who have written reviews, these are no more or less common than those found in reviews of other major brands. If we set aside the regrettable instances of defective units being supplied the general impression is that the Winix 50 pint dehumidifier is a competent appliance that bears comparison with the best of its rivals. The final choice may come down to a single feature, available on one model but not on another, or simply to the lowest priced brand available at the time of purchase. In general our view is that the Winix 50 Pint Dehumidifier is a well made and effective appliance with all the characteristics needed for use in a moderately sized basement and we are happy to recommend it to our visitors.